Zhou Shuoji is not a bitcoin believer. He says the cryptocurrency will never replace its traditional forebears, and he calls most of its proponents fanatics.But for Zhou, a 35-year-old high-speed trader in Beijing, bitcoin is also too good to resist. His computers trade it 24 hours a day, seven days a week. Using lightning quick orders, they profit from tiny price discrepancies on the myriad venues where it changes hands. “It’s the golden age to be in the bitcoin market, because it’s imperfect,” said Zhou, a former IBM technology consultant whose firm, Fintech Blockchain Group, runs a bitcoin hedge fund and venture capital fund.Forget libertarians, speculative individual investors and Chinese savers trying to spirit money overseas. The reality is that professionals armed with cutting-edge technology now drive as much as 80 percent of bitcoin trading, mimicking strategies honed by some of the biggest players on Wall Street. To them, bitcoin is just the latest asset class ripe for conquering with machines. Exactly how much they’re making is hard to pin down, because the vast majority aren’t required to disclose performance figures (Zhou declined to comment on his). One of the few traders willing to talk about their returns is Chen Zhenguo, who founded China’s largest platform for facilitating automated bitcoin strategies. Chen says he’s generated annualized gains of 50 percent for his own account, though he declined a Bloomberg News request to provide transaction details verifying his claims, saying they’re private. 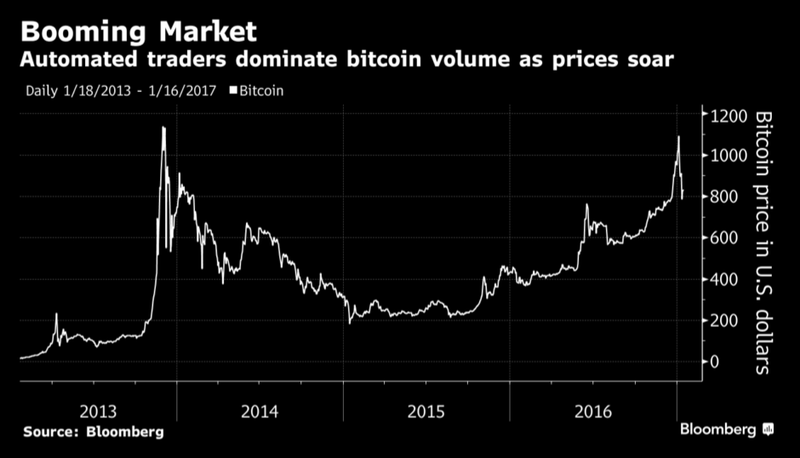 “Bitcoin has a natural advantage when it comes to automated trading,” said Chen, 30, whose Beijing-based BotVS allows clients to run live trials of their bitcoin algorithms on 23 exchanges. The cryptocurrency gained 6.9 percent to $890.77 at 10:18 a.m. in London.